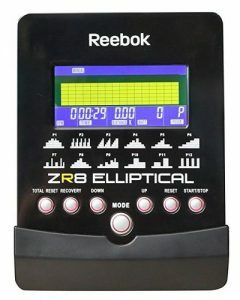 Reebok isn’t only a shoemaker; the company also produces a line of cross trainers that is exceptionally durable and easy to use. 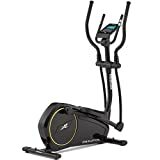 This is a cross trainer that comes with 12 pre-set workout programs and a staggering 32 levels of resistance, allowing you to adjust the resistance slowly over time. Before we go into our in-depth review, let’s take a glance at this model’s features. 12 pre-set programs for beginner to advanced users. Adjustable foot plates for a snug fit. Transport wheels to allow easy moving of the machine. Large 9 kg flywheel that allows smooth motion. LCD display that monitors speed, time, distance and more. Feature-rich, this is the top selling Reebok cross trainer, offering a smooth motion thanks to the 9 Kg flywheel design. The machine’s handlebars offers a static or moving option to any user that wants to be able to engage their upper body in a workout while also doing cardio. Designed to match a walking pace, it has a walking stride of 38.1cm. Floor level adjustment is offered to keep the machine sturdy, and the adjustable footplate offers anti-slip resistance. Choose between 12 pre-set programs. Users can choose to go off of a manual program that allows you to adjust the resistance levels yourself. In total, there are 32 resistance levels that will allow you to gradually increase resistance and ensure you continue to see positive gains as a result. The handlebars both have pulse sensors, which are monitored right through the LCD display. This will allow you to monitor your heart rate at all times when exercising. Users will also be able to see how close they are to reaching their calorie-burning goals. Using transport wheels, users will be able to bring the cross trainer out into an open space when needed, and easily wheel it back into the corner or a closet when finished. It’s a very convenient design that is meant to be as user-friendly as possible. The maximum user weight for this unit is 120 Kg. Advanced resistance levels not seen in most models. Pre-set options allow for a varying workout. Monitoring through the LCD is highly accurate. Provide a very taxing workout to the user. Support is greatly lacking despite the 2 year warranty. With the pre-set programs, individual programs and 32 resistance levels, this model is one of the top 10 models on the market today. However, the one issue that a lot of users seem to have is with customer support. Many people state that the company can take weeks to send out replacement parts and will need to be reminded frequently before parts are sent for replacement. Thankfully, it seems as if this issue is slowly being sorted out. Aside from the lack of support, there is a 2 year warranty. 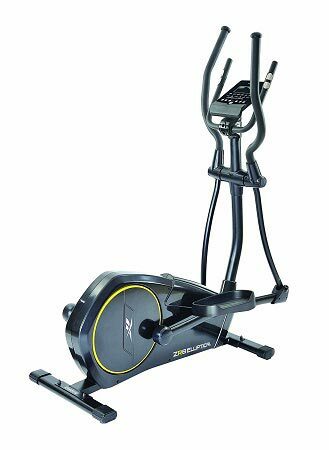 If you’re looking for a cross trainer that will last from beginner to advanced fitness stages, this is definitely the right option for you. Update: a new version of this cross trainer has been released: the Reebok ZR9 Cross Trainer.